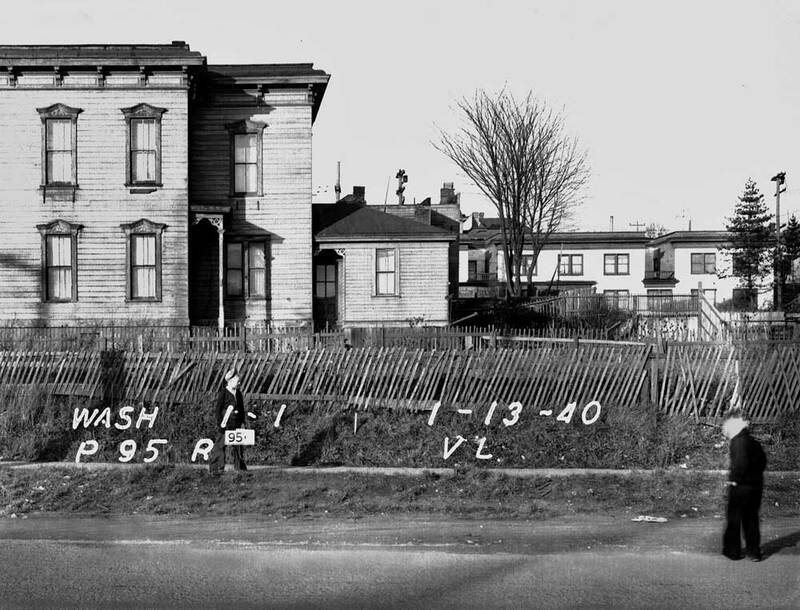 NOW: With the Seattle Freeway ditch behind and below him Jean Sherrard records a portion of the well designed, maintained and landscaped Yesler Terrace. 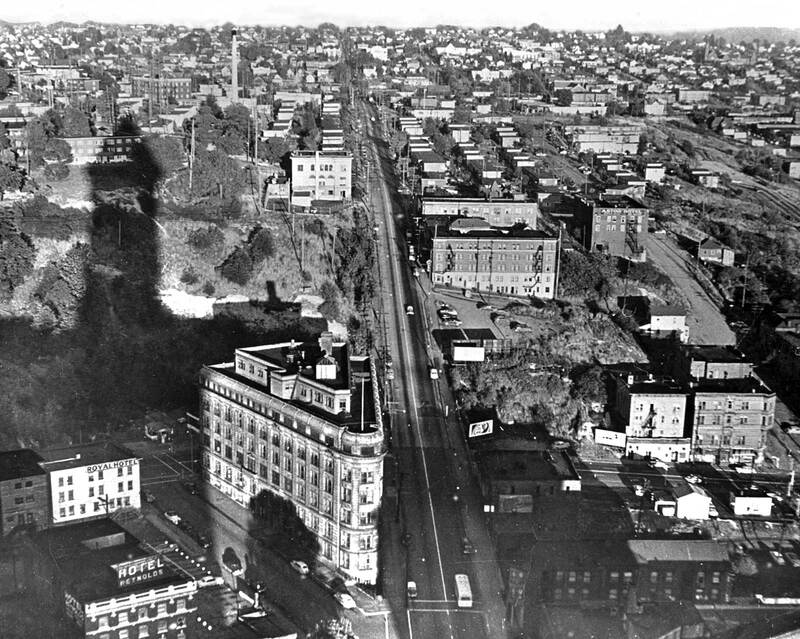 Perhaps the lens was too small but the Works Progress Administration (WPA) photographer who included the Sprague Hotel in the inventory of likely First Hill structures that would be razed for the building of Yesler Terrace, the Northwest’s first public housing, has cut off the street, Yesler Way, and its sidewalks. 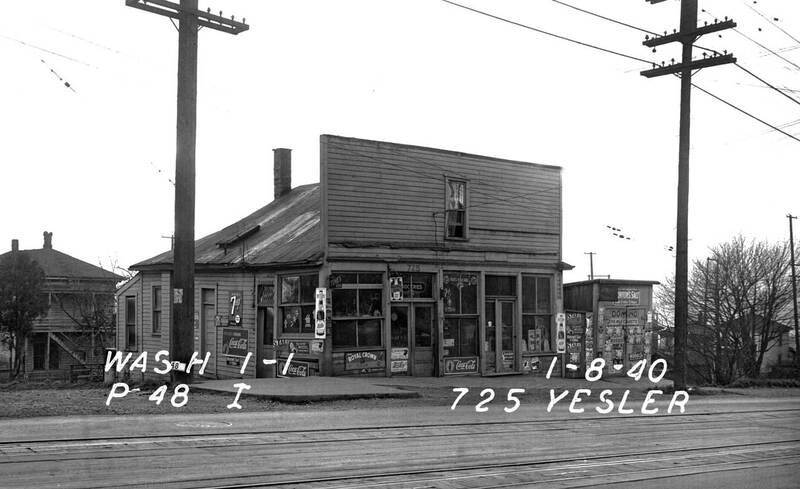 The inventory was done in 1939-40 and by 1941 all of this was gone, including Spruce Street on the left that here still meets Yesler Way at 7th Avenue, which is also out of frame. 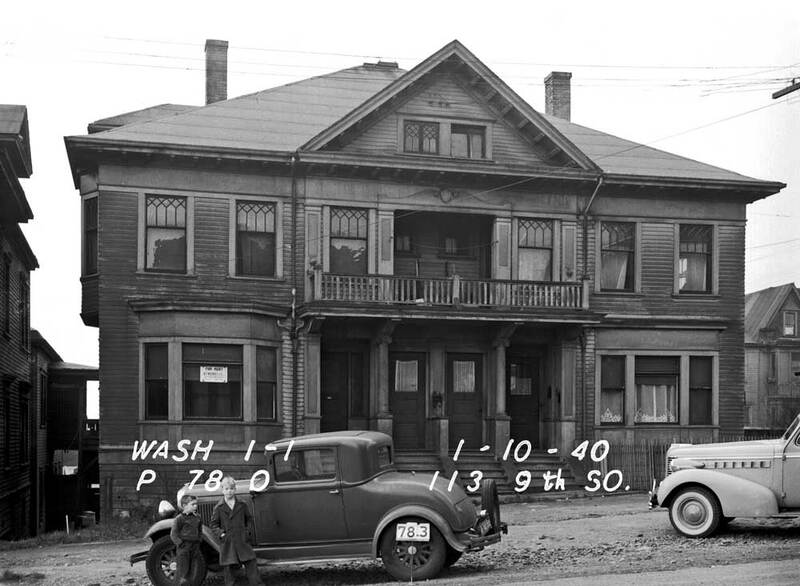 The curtains in the windows of the Sprague suggest that at least some of these rooms are still in use. That they are depression-time cheap is advertised in the sign posted above the second floor on the narrow nose of this pie-shaped hotel. 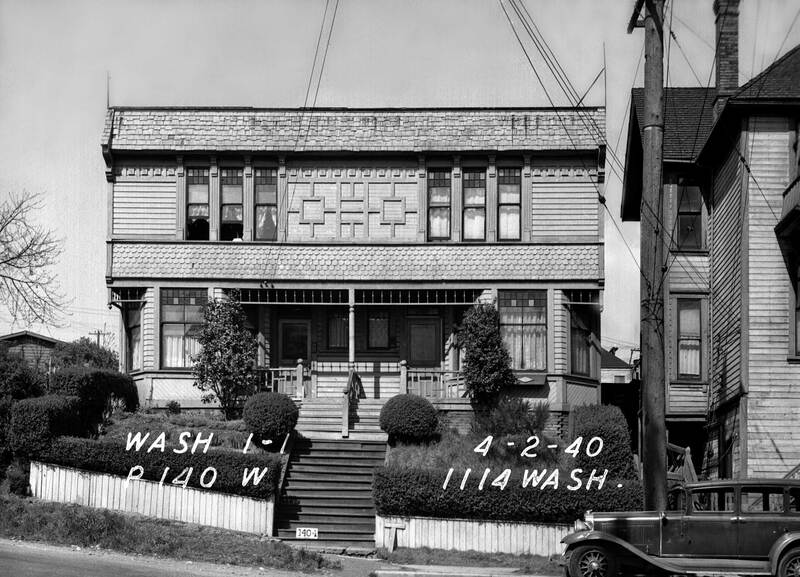 It reads, “Sprague Hotel $1.50 Week & Up, Hot and Cold Water, Free Bath, Good Service, Housekeeping Rooms.” Ikeda Taijiro is listed as the hotel’s manager in 1938, but for much of its earlier life an Emil Enquist was in charge. 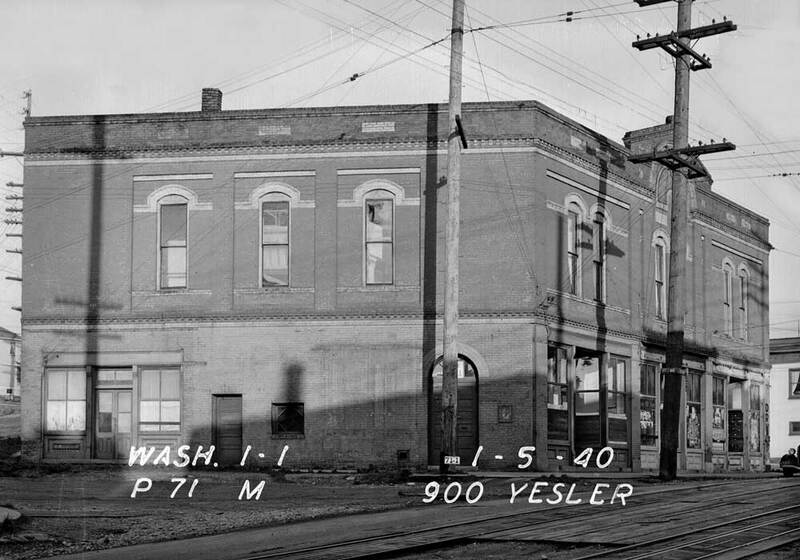 The windows of the vacant street level storefronts are signed “Cascade Dye Works and Laundry.” Before the crash of 1929 Ahiko Tsuginosuke is listed there with his dye business but following a few depression years he is gone. 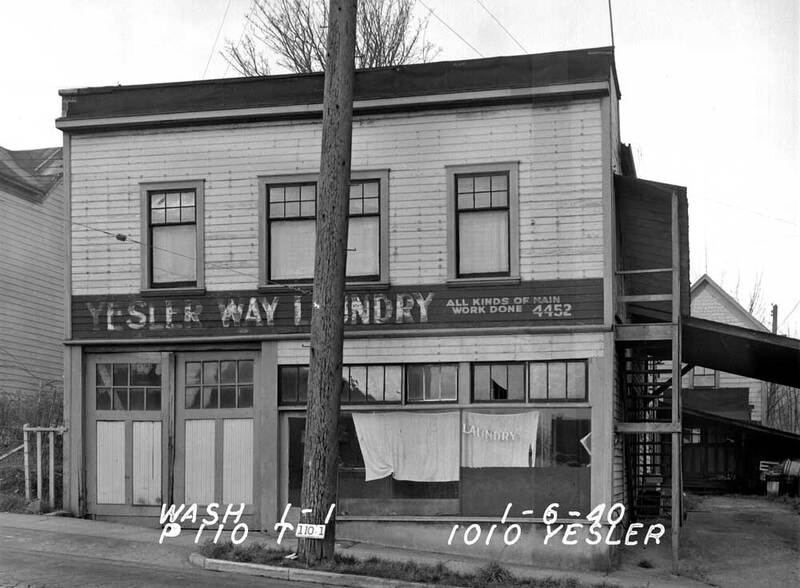 By 1935 the name Cascade has been taken by a laundry on Fairview Avenue in the Cascade Neighborhood. 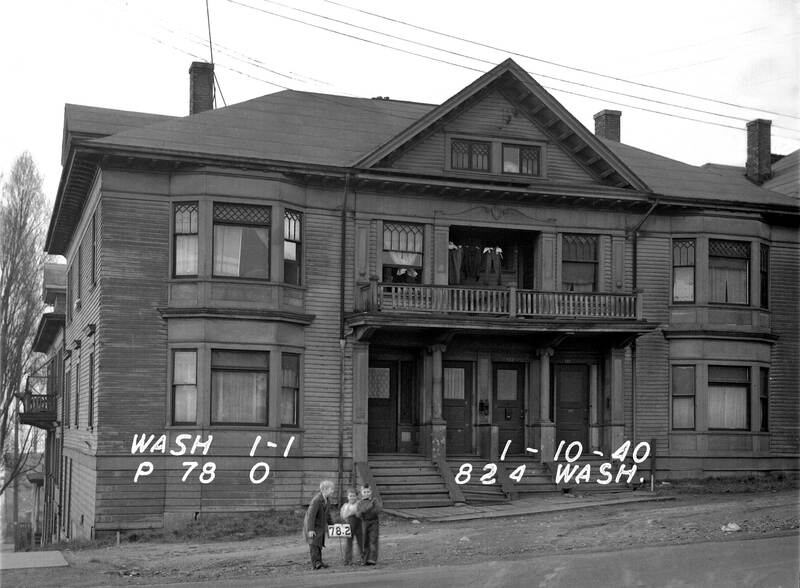 Early in the 20th Century combination dying and laundry businesses were commonplace – there are more than 150 of them listed in the 1920 city directory. By 1940 the number has dwindled to less than twenty. 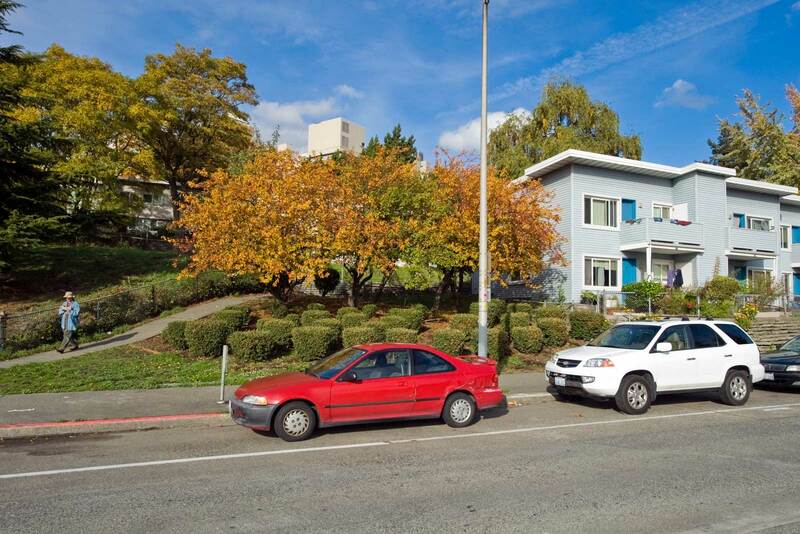 In part, because this often dilapidated “Profanity Hill” part of First Hill was multi-racial so was the public housing that replaced it. 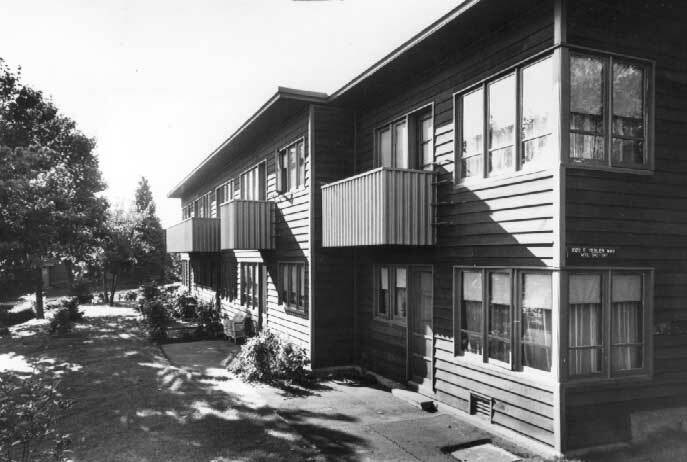 Thanks to the soft-spoken Jesse Epstein, the persistent and brilliant bureaucrat and UW grad from Montana who conceived of and ran the project, Yesler Terrace is thought to be the first integrated public housing project in the country. 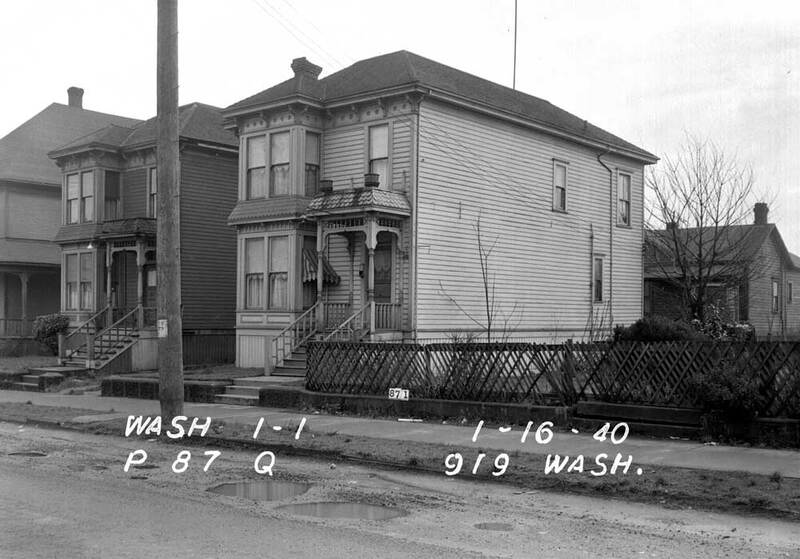 Additionally, Paul has unearthed a treasure trove of photos of houses recorded before Yesler Terrace. 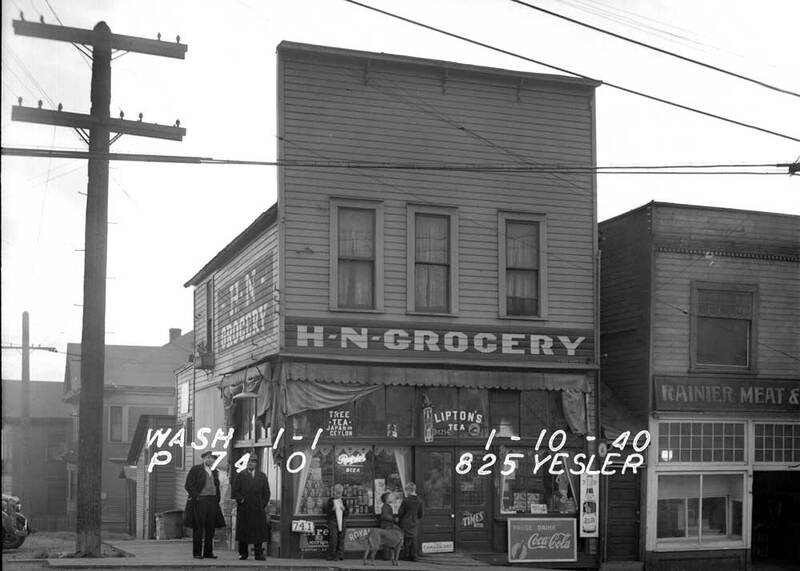 The structure shown above and the others below are from that part of the First Hill neighborhood that was popularly called “Profanity Hill” by the time they were recorded in 1940. All but two have their own captions written directly on them by the hand of whatever government surveyor/clerk did the work. 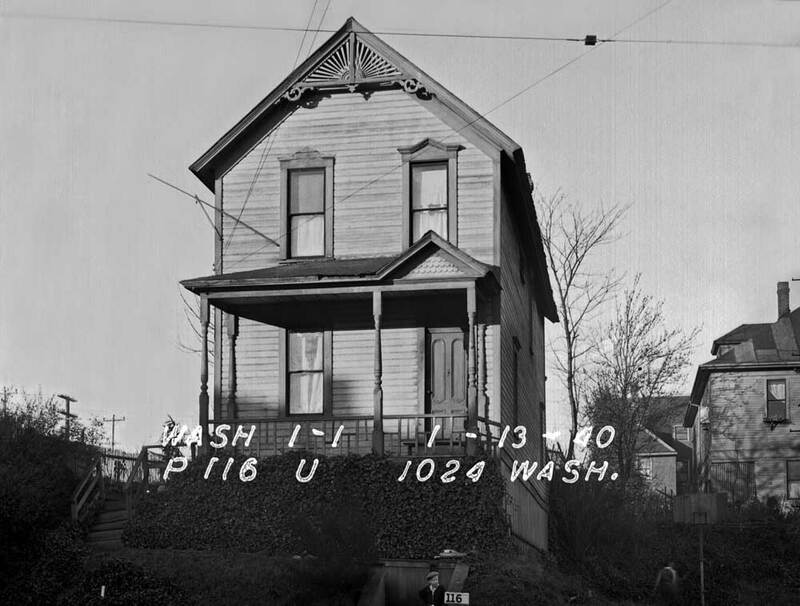 They follow much the form and even style of lettering used by the depression-time Federal WPA photo-census of all taxable structures in King County. 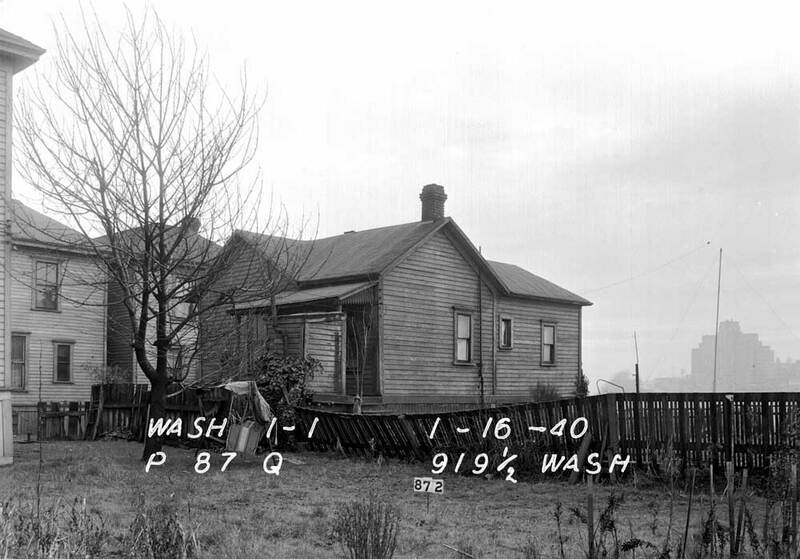 Many of you by now, I’d bet, if you own a home in King County have ordered the WPA picture of it from that survey – most likely from 1937 or 1938. 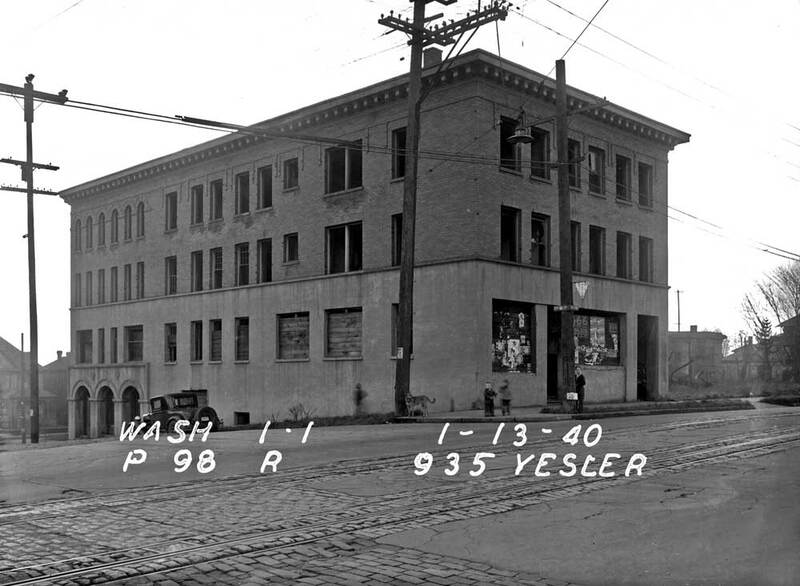 But these are from 1940 and have more to do with preparing to clear the land for the building of Yesler Terrace and completion of much of it for residency by 1943. 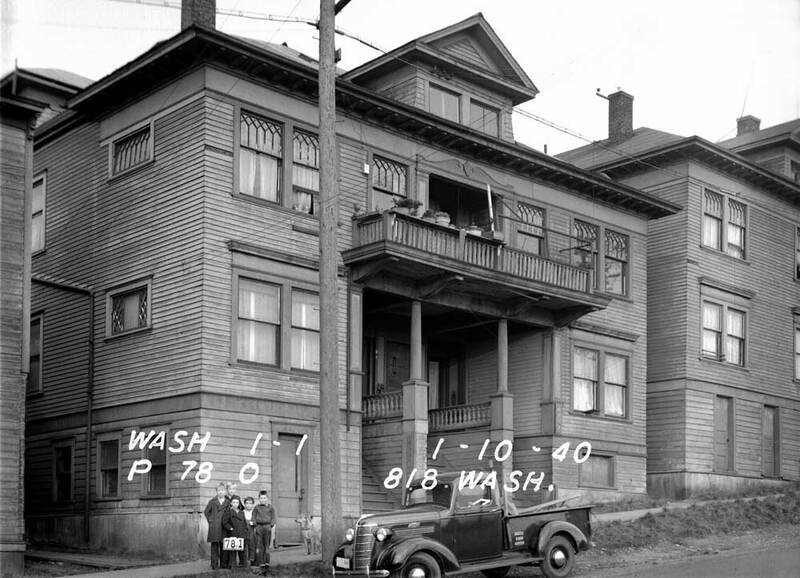 Perhaps these photographs were taken to help assess the values of the structures destroyed for the building of Seattle’s then first grand example of public housing. What may surprise you is how worthy some of the structures appear to us now, and how we would like to have the chance to restore them. 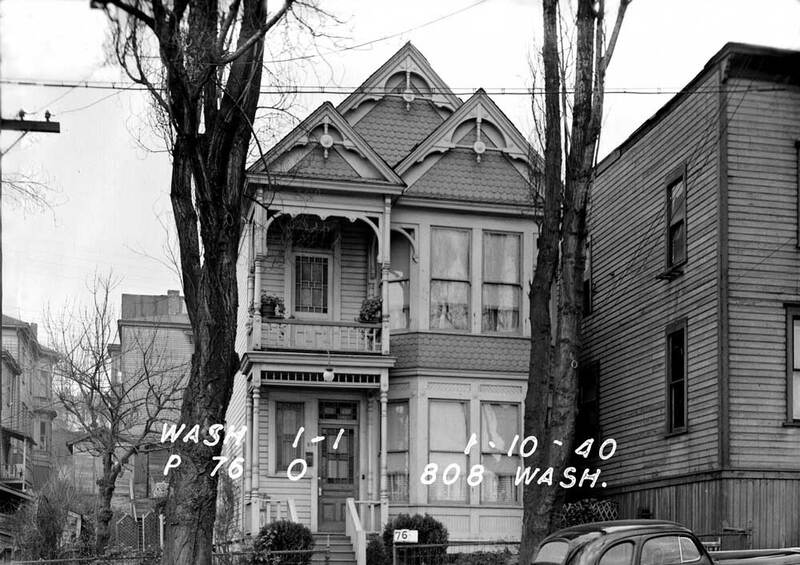 Perhaps a sample of these Victorian – often Italianate – residences might have been saved as landmarks. They could surely have added some variety to the uniform new neighborhood that was built over their remains. 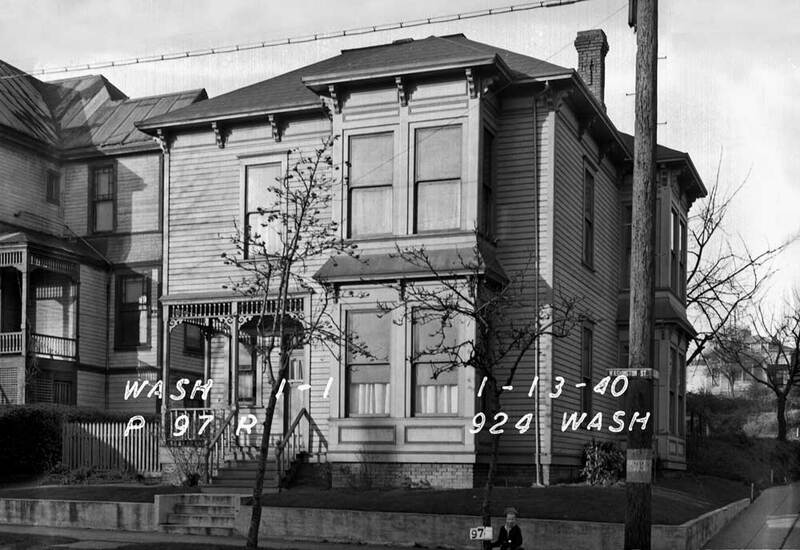 But in 1940 there was less sensitivity for landmarks and heritage than there is now, and by 1943 when Yesler Terrace opened and the country was in the midst of World War Two there was even less. 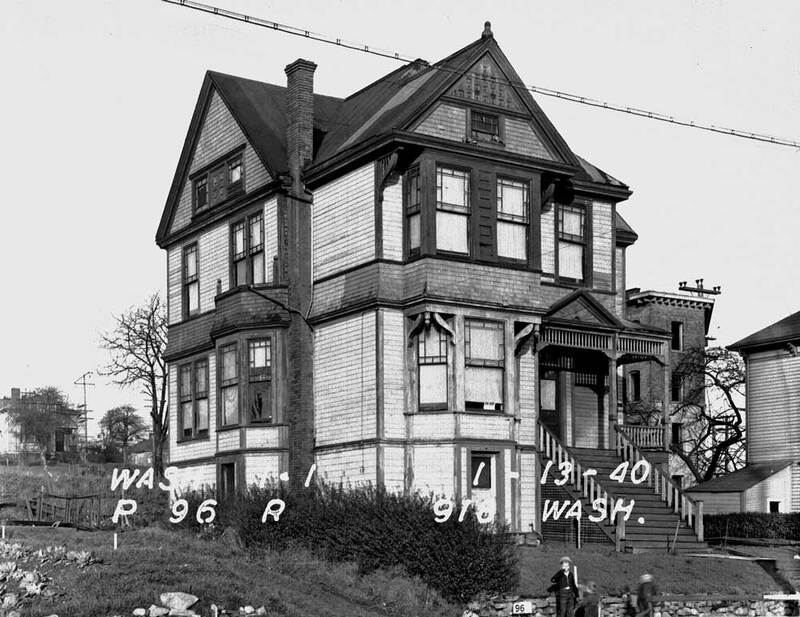 There are more pictures of these razed structures, and many of them, frankly, don’t look quite as worthy of preservation as the ones included in this batch. As time allows we will include some of those later. 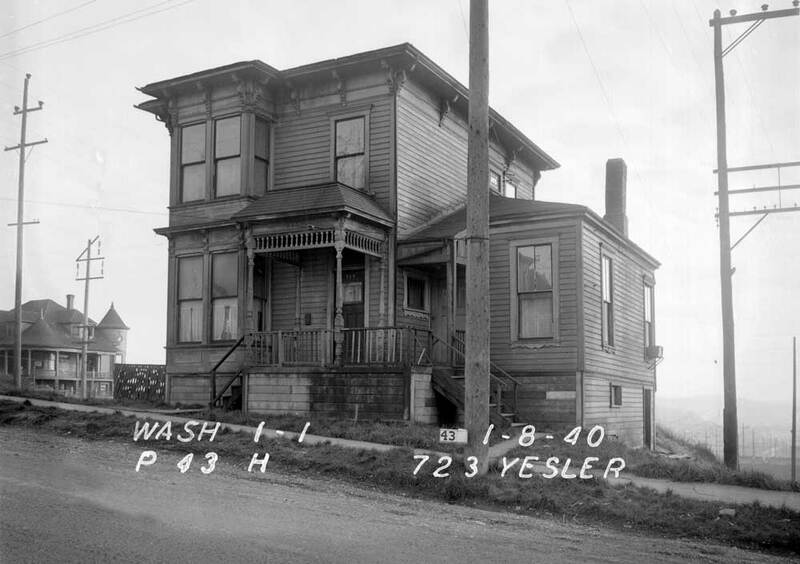 For comparison we’ll start with an early photograph of one of the Yesler Terrace units when it was new in 1943. 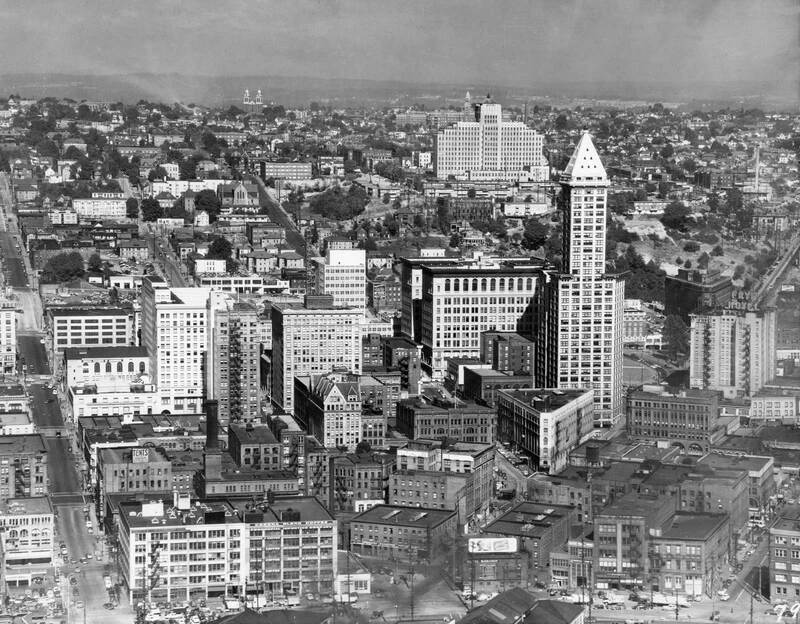 Attached below are two views east into the First Hill (Profanity section) Neighborhood from the top of the Smith Tower. 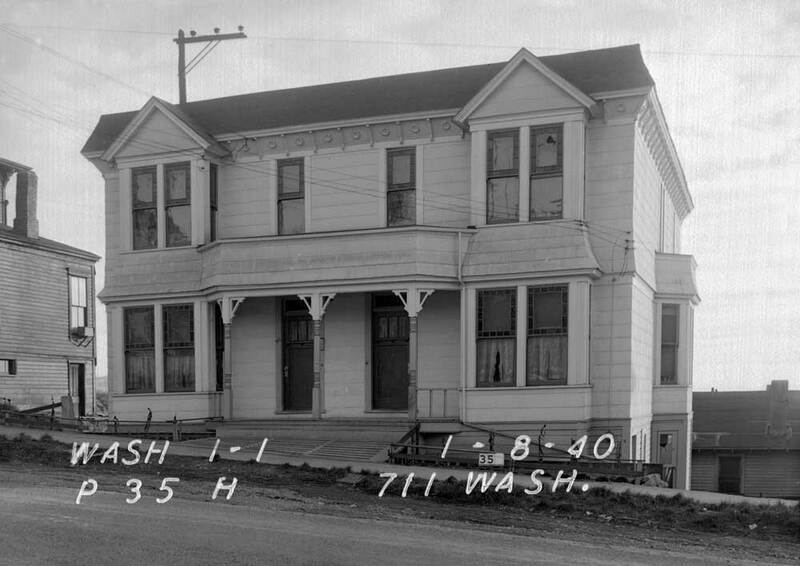 The first dates from ca.1913-14 when the tower was being completed. 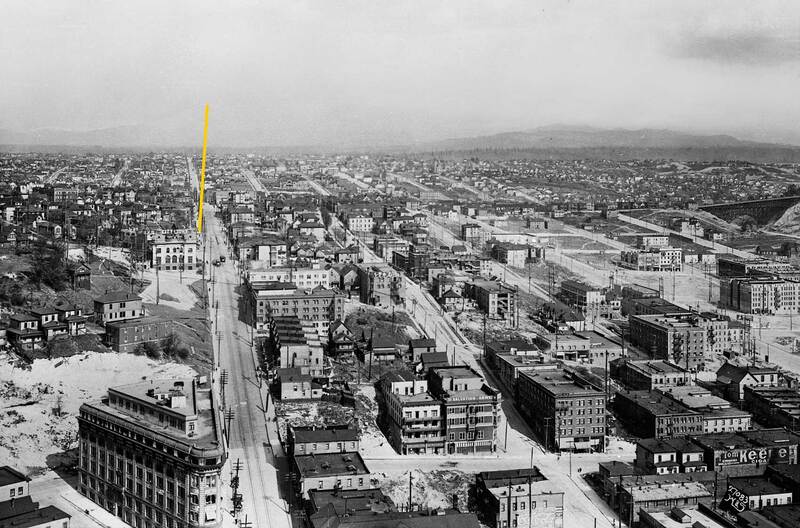 The yellow line dropping from the sky over Bellevue ends on the roof of the Sprague Hotel, the structure featured at the top. 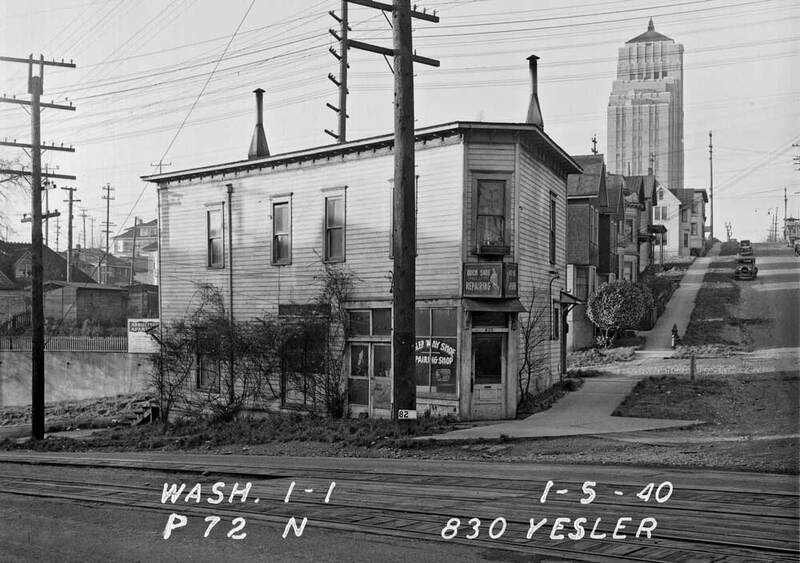 The blocks to the right or south of Yesler Way are still being developed following the completion of what is called the “Jackson Street Regrade” but actually involved many more streets and avenues. 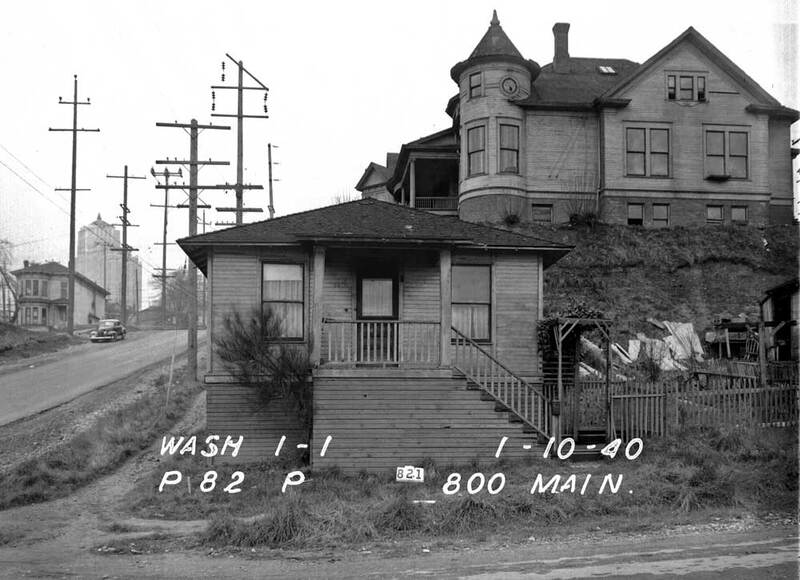 Second only to the Denny Regrade this one, along 9th Avenue and between Jackson and Weller (roughly) dropped the spine or crest of the ridge that includes Capitol, First, Beacon and the rest as far south as Renton, about 90 feet below the old grade. 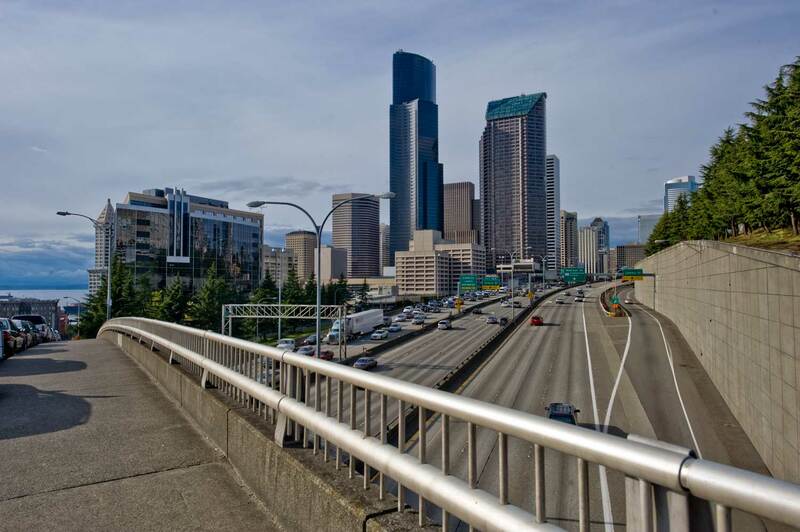 Far right is the nearly new 12th Avenue Bridge over the also new Dearborn Cut. 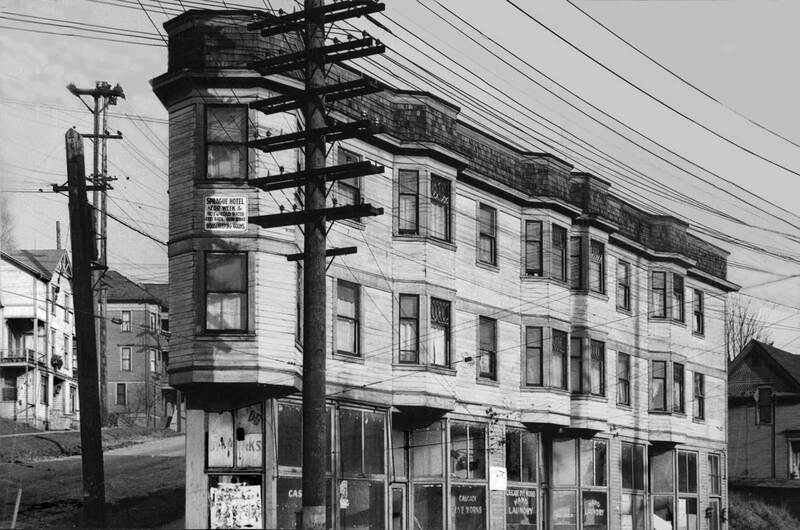 If you click to enlarge this panorama you will find many other still familiar landmarks. Or you can go searching for the structures that appear in the collected thumbnails views just above. Their location is – with one exception – more than hinted with their internal captions. I love the WPA shots (in “Sacrifices”). Every single one of the houses that I clicked on had a little kid standing in front of it. Some of them even look like the same kid, like maybe he followed the photographer around so as to get into multiple shots. Glad to see the old stomping grounds..